My ears have finally arrived after a long journey and let me say that the wait is finally over and I couldn't be happier with them! I love them to bits and I only just received them! KPP was even sweet enough to add some extra gifts in since there was a bit of a delay in receiving them. As my first pair of KPP ears I am thoroughly impressed with the crafting of these! Thank you again! I've waited a few months for my order, due to some issues you guys have been having, but I gotta say- it was totally worth the wait! Ears look exactly like on a picture, are really soft and look adorable when on head. 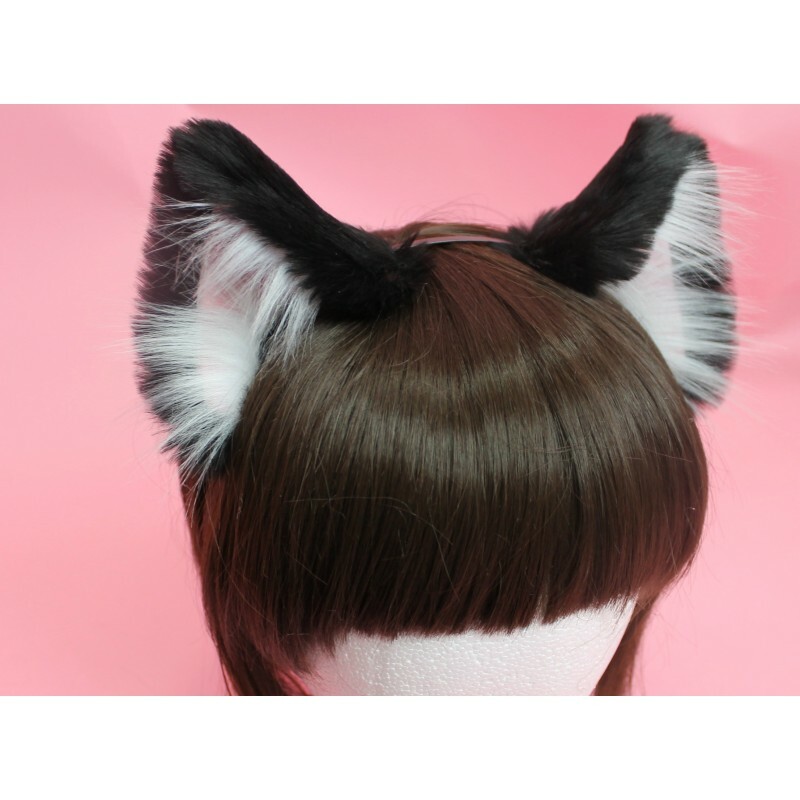 Do recommend buying those as first set of ears- they will definitelly fit a lot of hair colors and styles. I've had these ears for a month or so now, they are my dream ears that I've had my eye on for a long time. I was sceptical at first about whether I'd like them or not as they do appear smaller in person, however once wearing them they look quite big and realistic! The craftsmanship is amazing and the ears are great material and super fluffy and realistic feeling. I can't wait to order a matching tail! Packaging was also great, and I enjoyed the freebies the girls threw in with my order! It was a very quick delivery considering I'm in the UK and I don't have a single bad thing to say! Will definitely be ordering more in future! I have wanted these ever since I saw them, and when I was finally able to get them I jumped to it. I am even happier with them than expected. They are super cute and the head band isn’t too visible. They are my favourite item~ and I will most definitely be getting more! Alrighty, so I ordered these back in June. It took quite some time to finally receive them, longer than I wanted, and I tried to be patient. It was difficult and I lost my composure on them and I am very sorry. They held it together though. Professional in their responses. The team had gone through some stuff which explains the length of time it took to get these to me, but I hope they are holding together strong, they make some amazing ears/tails! I will be recommending this website to my furry friends. Hopefully I can save up and order again! The qaulity of the ears and tail I ordered are great! These ears were even better than what I was expecting! They are so soft, the perfect size, and extremely well made. These are my new favorite ears! The softest, cutest things I have EVER owned!! they fit my head perfectly and are amazingly comfortable to wear. They arrived a day early and I get to surprise my boyfriend with them. These ears are beautiful and I feel pretty. Very well made and soft! Only complaint I have is that I wish KPP would offer clip ins for their in stock handmade items!! That's my only complaint. 10/10 service and fantastic quality. a little smaller than i thought but goshdarn it's cute. I received it in a little over a month and I was so surprised! very comfortable to wear and most definitely adorable! I am a first time customer and I have to say I am very pleased with the order. The downside is that the other item that was in the box came broken and unwearable, but the main item that I mostly looked forward to came perfectly fine and beautiful. My ears got here a little sooner than expected, and I absolutely love them! The headband is so comfortable I forget I'm wearing my ears some times haha not to mention how perfectly it blends in with my hair, you can barely see it. If I could I would buy everything on this site, it's absolutely amazing! I LOOOOOVE MY KITTY EARS! These are my first kitty ears! I attached a chain with a heart charm and I AM IN LOOOOVE!!!! They are soooo soft and the chain is properly attached and they arent too big or too small...they are PERFECT! I was going to make a review and unboxing on youtube but i was TOO EXCITED!!! *The velvet is really amazing as well. Not soft but it doesnt affect the look. ~THANK YOU SOOOOO MUCH FOR THE AMAZING KITTY EARS KPP!!!! Im so going to buy more!! The ears are excellent quality! I didn't expect them to be so fluffy and well made! The fur is incredible soft and the ears are pretty hard attached to the headband. I was scared that the attachment would be too low so they would flip over, but the attachment is perfect! The ears are wired so you can make them more pointy or floppy like you want. I love them so much, they fit so well and I totally adore these ears! 10/10 would always buy again!